Once, winner of eight Tony Awards including Best Musical and winner of the 2013 Grammy Award for Best Musical Theater Album, brings its musical magic to The Bushnell. Based on the low-budget motion picture by the same name which captured hearts -- and a 2007 Academy Award for music-and-lyric team Glen Hansard and Marketa Irglová (believe me, you have heard "Falling Slowly") Once invites the audience into one special week in Dublin, where a Guy (Stuart Ward) meets a Girl (Dani De Waal) and they make beautiful music together. 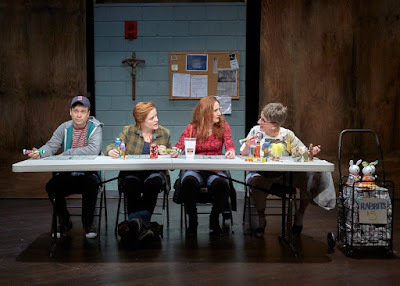 That invite to join is quite literal -- Bob Crowley's paneled Irish pub setting featuring warm lighting designed by Natasha Katz is open for business before the curtain and during intermission where audience members can enjoy the cash bar and jam sessions with the actors who all play their own instruments. Mirrors along the walls, including an oversized one above the bar, make it appear that we all are seated at the pub. The story, written for the stage by Enda Walsh and based on the film written and directed by John Carney, tells of the fact-based friendship between a Dublin songwriter and the woman who inspires him. John Tiffany directs with Steven Hoggett providing stage movement that allows the cast members, who never leave the stage, to react to the music being created. When they meet, Guy is at the end of hope. His love has left him for America and his song-writing career isn't going anywhere. About to give up, he meets a blunt-talking, no-nonsense Czech Girl -- he calls her "the ambassador of honesty" who inspires him to take up his guitar again. The two bond on a very deep level, despite the fact that Guy hopes to pursue his lost love in America and Girl, raising her little daughter Ivanka (Sarah Mckinley Austin) with the help of her family, is married to an absentee husband. Inspired by Guy's music, Girl writes some lyrics to unfinished pieces and convinces Guy he must perform it. Over five days, they collaborate and record a demo CD. Assisting them are Billy (Evan Harrington), who, smitten with Girl, allows her to play a piano in his music shop, a banker (Benjamin Magnuson), who is moved by Girl's persuasive plea and funds the recording session, and Guy's Da (Scott Waara), who helps his son get to New York. The memorable, soul-touching, catchy tunes (Music Supervision and Orchestrations by Martin Lowe) thoroughly developed characters (even the minor ones with Harrington delighting with some comic relief) and a heartwarming story dotted with delightful humor all blend to make this a ballet of love and hope. De Waal is excellent lending a lovely voice to the haunting, piercing and mellow songs while playing the piano. Ward shows skill on the guitar, but seems to try to be recreating the sounds of Steve Kazee who originated the role on Broadway (and won a Tony for it). So some moments seem to be a performance instead of a burstof emotion from the soul as intended. Meanwhile, the sound (designed by Clive Goodwin) is off and much of the dialogue and lyrics -- particularly Ward's --are lost. Czech translations projected during Girl's conversations with her family probably would be better used to give English subtitles here. It's well worth the experience, though, if just to hear the beautiful "Falling Slowly," which makes you want to sing along (and which, unfortunately, some folks seated nearby did). It's a musical definitely worth seeing more than once. 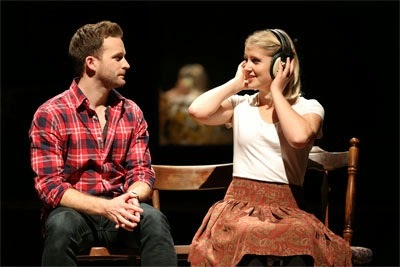 Once plays at The Bushnell, 166 Capitol Ave., Hartford, through May 31. Perforances are Tuesdays, Wednesdays and Thursdays: 7:30 pm; Fridays and Saturdays: 8 pm; Saturdays at 2 pm; Sundays 1 and 6:30 pm Tickets $21-$92: (860) 987-5900; www.bushnell.org. Some of the creatives who teamed to bring us the Tony-Award-winning musical A Gentleman’s Guide to Love and Murder reunite to bring a well staged production of Kiss me Kate to Hartford Stage. The show itself, with music and lyrics by Cole Porter, isn’t a favorite, however, despite the fact that the original production ran for more than 1,000 performances on Broadway and won the first Tony Award for Best Musical. This co-production with The Old Globe is lovingly directed by Darko Tresnjak with fresh choreography by Peggy Hickey, who along with Set Designer Alexander Dodge (Tony Award nominee); and Lighting Designer Philip Rosenberg filled out the Gentleman’s Guide team. There’s a neat roll into the opening number “Another Op’nin’, Another Show,” but the freshness goes stale with the original book (with its less than positive approach to women) from Bella and Samuel Spewack. Kiss Me Kate is a show within a show. A touring company is getting ready to present a musical production of Shakespeare’s Taming of the Shrew in Baltimore (hence all of the multiple roles you see listed below). The show’s leading man, producer, director Fred Graham (delightful baritone Mike McGowan) has reunited with his ex-wife and leading lady Lilli Vanessi (Anastasia Barzee) for the run. The couple hates each other (was it her temper or his ego that broke up the marriage?) and trades insults, but just beneath the surface, embers of their passion wait to reignite. When Fred’s flowers and love note for show-girl mistress Lois Lane (Megan Sikora) erroneously find their way to Lilli’s dressing room, she is agreeable to rekindling their romance, but when the truth comes out, the actress wants out. Some gangsters (well cast and funny Brendan Averett and Joel Blum) enter the picture, having mistaken Fred for Lois’ former dance partner, Bill (Tyler Hanes), who owes their boss a gambling marker of $10,000 and ensure Lilli stays in the production so the box office receipts can be contributed toward the debt. Complicating matters is Lilli’s rebound engagement to politician General Harrison Howell (Tony Lawson). 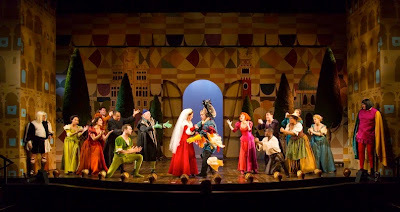 Action abounds as Hickey dances the cast around Alexander Dodge’s cartoonish, but meticulously detailed set (complete with an unnecessary rotating floor). There’s even some tap. But the story…. Sorry, I just can’t get excited about a plot that involves physical abuse (both Lilli and Fred hit each other to such a degree that the services of Fight Director J. Allen Suddeth are needed). Whips are involved at one point. Even Shakespeare’s plot involves women being sold into marriage against their will. These plots don’t engage me, and I certainly don’t find them entertaining. Porter’s score, on the other hand, with a 15-member pit orchestra directed by Kris Kukul, is worth hearing and gives us a chance to sit back and enjoy classic tunes like “Too Darn Hot,” (which is a nice song, but doesn’t have much to do with the plot. . .) “Wunderbar,” “So in Love,” and “Brush Up Your Shakespeare” where Averett and Blum have a chance to really shine. Solo voices all are good, with Charity Angel Dawson standing out in the supporting role of as Hattie, Lilli’s maid and confidant (and a featured singer on a couple of the tunes). Blending of voices on chorus numbers sounds just off the note occasionally, however. 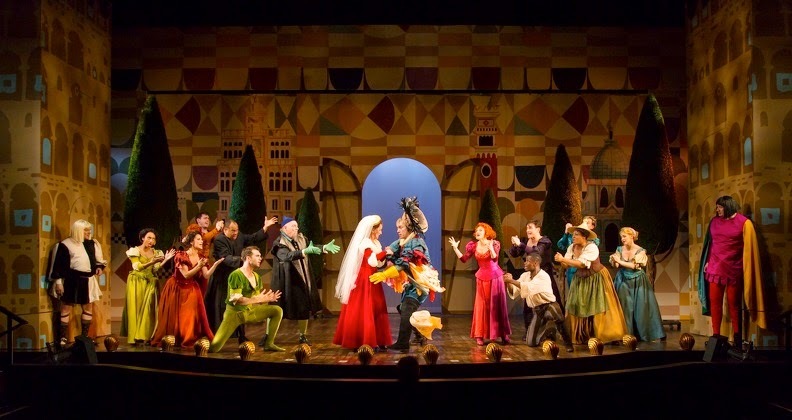 Kiss Me Kate runs through June 14 at Hartford Stage, 50 Church St., Hartford. Performances Saturdays and Sundays at 2 pm (special matinee Wednesday, June 2 at 2 pm); Tuesday, Wednesday, Thursday and Sunday at 7:30 pm; Friday and Saturday at 8 pm. Tickets: $25-$80; (860) 527-5151; www.hartfordstage.org. Join members of the cast and artistic staff for a free discussion, immediately following select 7:30 performances on Tuesday or the Wednesday matinee free. Open Captioned Performances, May 31, 2 and 7:30 pm performances for patrons who are deaf or have hearing loss. Free. B2 Productions LLC in Norwich, CT has announced finalists for the seventh annual Connecticut High School Musical Theater Awards. (CHSMTA). The Black Tie Awards Gala will be held 6:30 pm Monday, June 1 at The Palace Theater in Waterbury. The awards are founded and produced by Brett A. Bernardini. 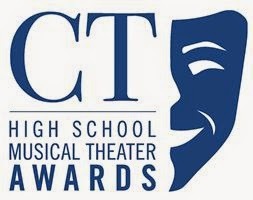 As the nationally designated, high school musical theater awards program for the state of Connecticut, The Connecticut High School Musical Theater Awards are connected with The National High School Musical Theater Award Program based in New York City. 16 awards will be presented along with performances of nominated schools, soloists and accompanied by a full orchestra. The recipients of the CHSMTA awards for Outstanding Actor and Actress with travel to New York City at the end of June 2015 where they will join with others young people selected from other similar State program runs by professional theaters, from all across the country for the annual presentation of The Jimmy Awards. The National High School Musical Theater Awards, produced by The Broadway League, is a national celebration of outstanding student achievement that recognizes individual artistry in vocal, dance and acting performances by high school students. “The Jimmy Award” is named in honor of James M. Nederlander, legendary Broadway theater owner and producer. Over the past years, The CHSMTAs have had six finalists: Stephen Mark, Grace Hardin, John Jorge, Katie Oxman, Taylor Varga, Jillian Cailoutte) and 2 National winners!! (Stephen Mark, Ridgefield HS and Taylor Varga, Newtown HS). Tickets for the gala event are on sale through The Palace Theater Box Office, 203-346-2000. Michael Shannon in The Killer. Photo: Gerry Goldstein. Hartford Stage Artistic Director Darko Tresnjak has received an Obie Award for his direction of The Killer Off Broadway at Theatre for a New Audience.